Home Tags Articles tagged with "trail"
Around the time the United States began its fight for independence from Great Britain in eastern North America, Spanish explorers on the other side of the continent were making their territorial marks. What is considered by some to be one of the most influential of those exploratory missions passed through what is now Maricopa’s backyard. The Bureau of Land Management is taking action to preserve the historic route, the Juan Bautista de Anza Trail. Cheryl Blanchard, a BLM archeologist, is spearheading the Anza Trail preservation project. She said the trail can be clearly found deep in the monument. It is, however, difficult to reach. “At this point you can hike in there or take horse,” Blanchard said. BLM wants to educate people about the remarkable story behind the Anza Trail. In 1775, the Criollo son of a landed family from Basque, Juan Bautista de Anza, was granted an exploratory commission to settle what was then known as “Alta California,” northern California today. At the time, Russian, British and Spanish explorers were vying for control of the Northwest and its vast resources. Anza was tasked by the Spanish viceroyalty in New Spain to travel to Alta California and establish a settlement. His party made its way northwest through Arizona and into California, where they eventually founded a settlement on the southern point of a large tidal inlet they called San Francisco. Though Anza officially embarked on the journey from the presidio at Tubac in southern Arizona, he built up his expedition much farther south with settlers from as far away as Culiacán Rosales and other towns in the modern Mexican states of Sinaloa and Sonora. The 200 colonists led by Anza and several native guides represented 30 families, most from Culiacán, who comprised a diverse demographic of Criollo (pure blood Spanish born in the New World), mestizo (indigenous-Spanish mix) and African slaves. The expedition was a full-service mobile town with blacksmiths, weavers, ranchers and livers; anything and everything one might need to seed a community from scratch. After learning a hard lesson from a failed expedition several years earlier in which they failed to secure sufficient water sources, Anza led his party north following river systems wherever possible. 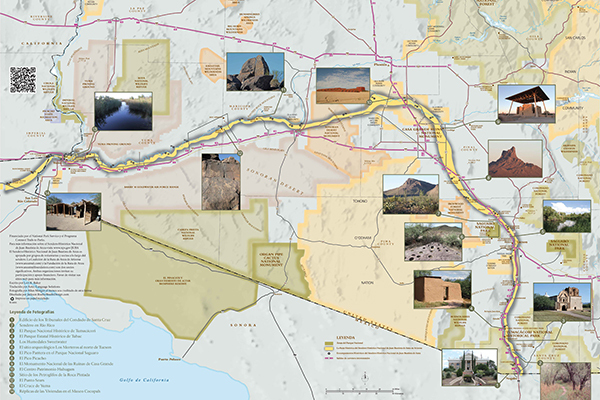 Under the guidance of their native navigators, for a time the group followed what are now known as the Santa Cruz and Gila rivers north and west across the future Phoenix valley and into the Sonoran Desert. The party then crossed into California via Yuma, made its way to the coast and headed north via modern-day San Diego and Los Angeles. They eventually settled in the Bay Area. The 1,200-mile trail, not inclusive of the 600-mile Mexican segment, is at times wide and indiscernible. However, hidden in not-so-accessible places in the Sonoran Desert National Monument just west of Maricopa, there is faded but recognizable evidence of the trail that will hopefully remain preserved. The Juan Bautista de Anza Trail is one of 19 national trails in the United States and continued to be used by future explorers and frontiersman for much of the 18th, 19th and 20th centuries, including the Mormon Battalion and Butterfield Stage Line.